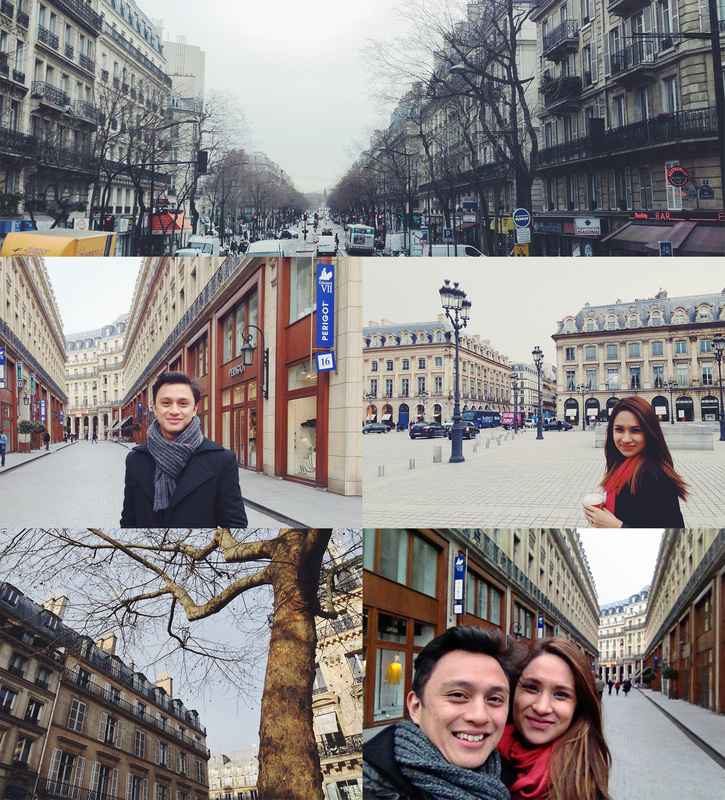 We were so blessed to be able to spend our honeymoon in Paris. Needless to say, we absolutely LOVED it. 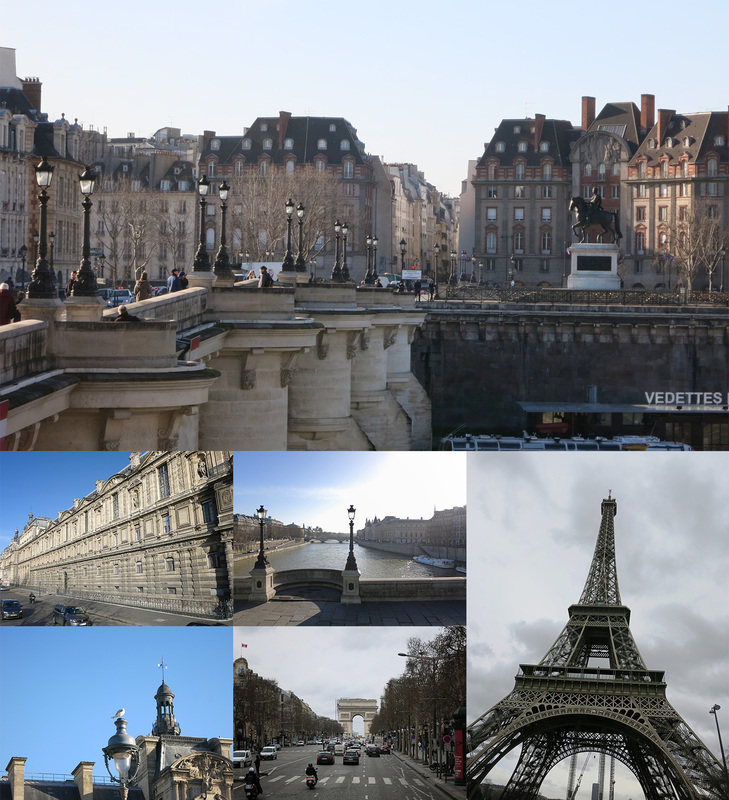 Some may think that a Parisian honeymoon is “cliche” or that the city is overrated, but we couldn’t disagree more. 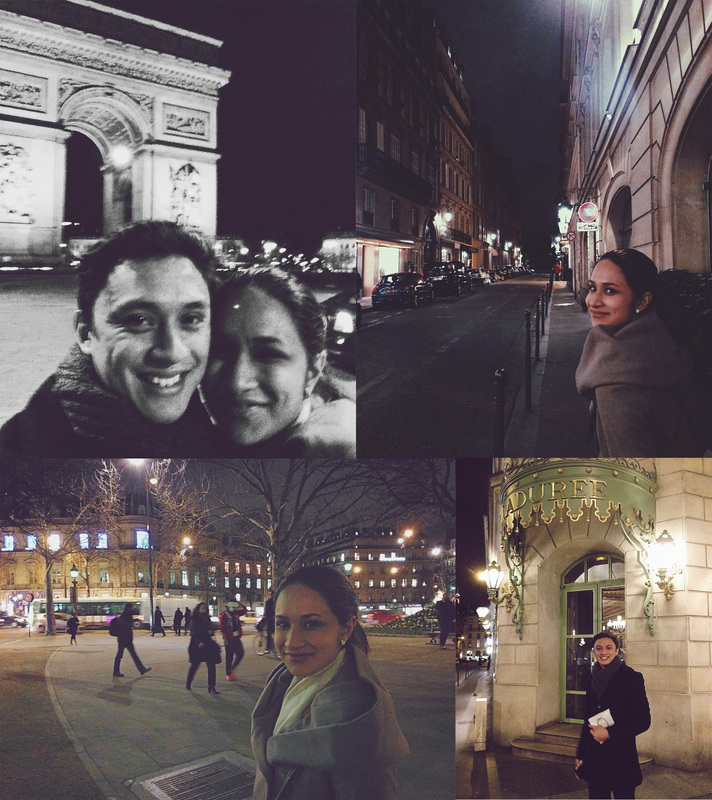 As our first adventure as husband and wife, this trip to the City of Love will be hard to beat. We hit gold with the hotel that be booked through Expedia. It was a boutique hotel located right on Saint Honoré (in front of Balenciaga and just beside Miu Miu), just a stone’s throw away from Jardin de Tulleries. The rooms were “frenchy” in style and had several balconies overlooking the street, making you feel like you’re living in Parisian apartment. The rooms were clean, the bathrooms were modern, and the staff were extremely kind and helpful. Our first official stop was the La Vallee Village Outlets which is about 45-mins from the city. For convenience, we decided to take the shuttle from Rue de Pyramides which I booked through their website (alternatively, you can take the metro). La Vallee Village is known to be a shopper’s haven for designer goods. 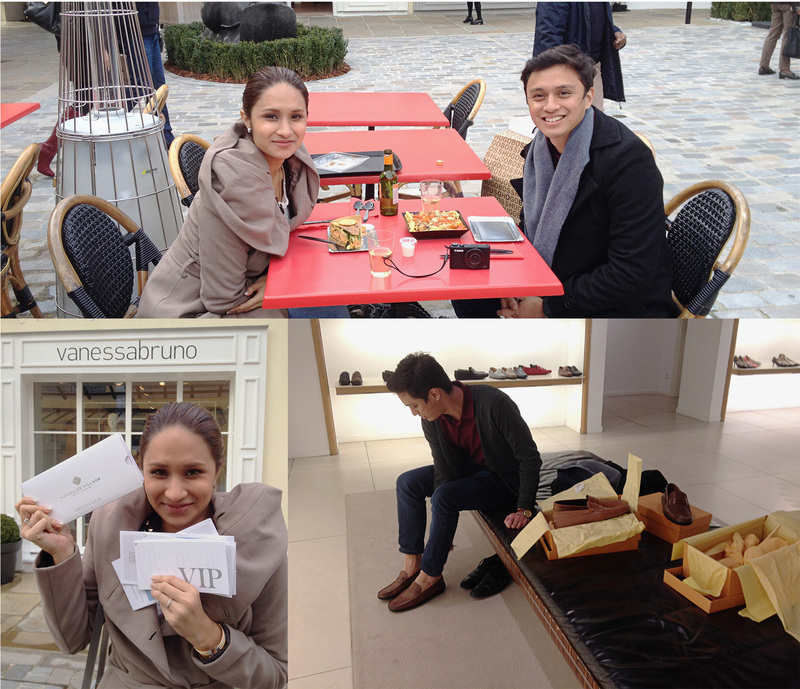 We found that brands like Tods and Vanessa Bruno seemed to have the best deals. 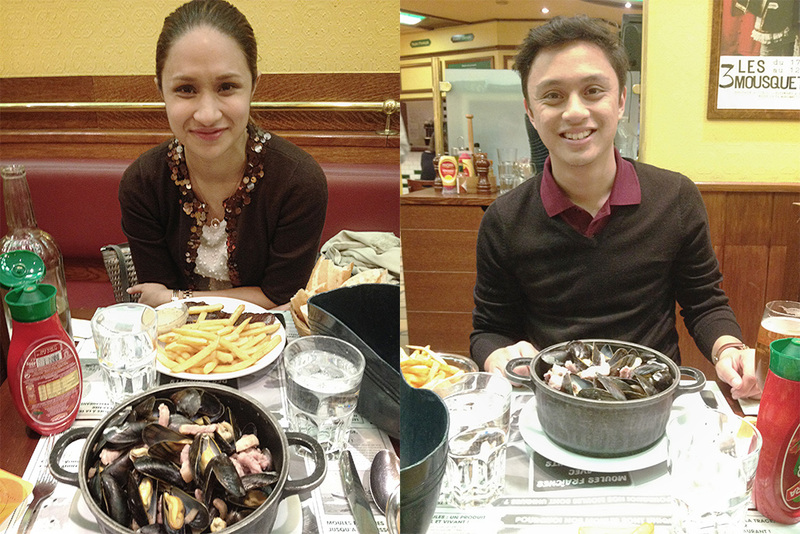 Leon’s may not serve French cuisine but it has always been on the itinerary when my family visits Paris. This restaurant is known for their Belgium style mussels cooked in a variety of mouthwatering broths. The menu has everything from butter and garlic, to white wine and shallots, and creme fraiche with grainy mustard, bacon, and onions… the options are endless! You’ll leave the restaurant with a very happy tummy. 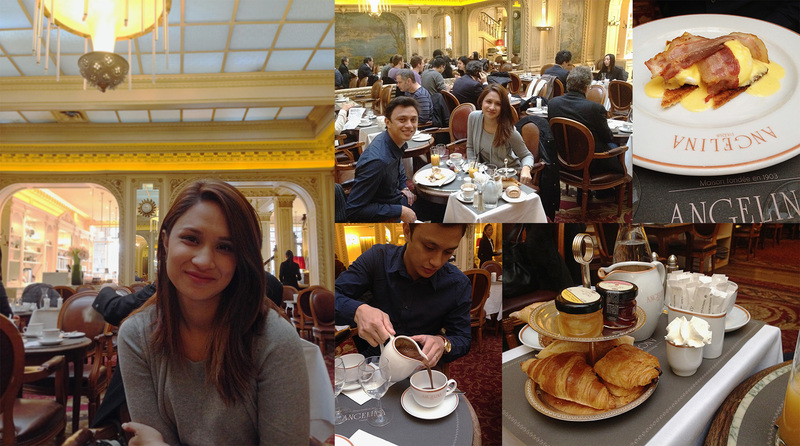 For our second day in Paris, we decided to indulge in breakfast at Angelina on Rue de Rivoli (also a short walk from our hotel). We decided to go on a weekday, knowing that weekend queues are crazy. We ordered their standard breakfast set and a pot of their famous for to-die-for hot chocolate. The rich hot chocolate is typically served in a pot and is accompanied by a bowl of whipped cream allowing you to adjust the sweetness and creaminess of your cup. There’s nothing like homestyle French cooking on a cold winter day. Their exotic flavor combinations give Ladurée a run for their money. This is a lovely place for breakfast. If you’re coming from the Notre Dame area, St. Régis is just across Pont Saint-Louis. Their french bread, omelettes and coffee make for a delightful way to start your day. I’ve been there twice and the waiter has consistently tried entertaining us with his wit and unusually high energy. 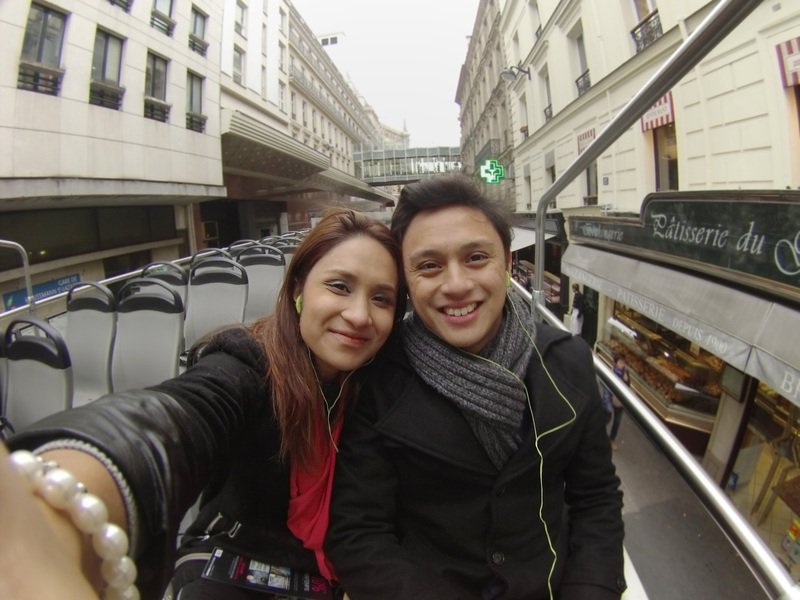 In my opinion, if it’s your first time in Paris, this is the best way to see the city! On one of your first few days, take one full round in the daytime and one full round at night. I would recommend getting off mostly just at the locations that are far from your hotel (and harder to get to). Otherwise, use the bus to get oriented with all spots and landmarks so that you can pick and chose which ones are worth going back to and spending time in. 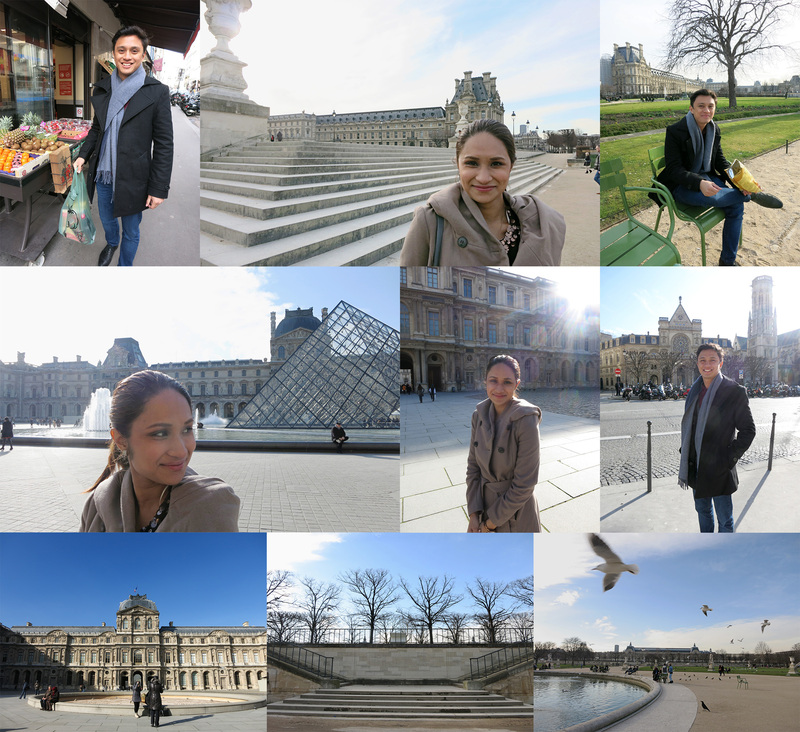 To be in Paris on Valentine’s Day is such a treat for the senses! The sights and sounds of the city meet the scent of fresh roses. At every corner, flower shops are overflowing with the lushest of blooms and you’ll see men of all ages carrying bouquets that are larger than themselves. Created by the same architect as the Eiffel Tower, La Fermette Marbeuf is an elegant restaurant located on Rue Marbeuf, just a short walk from Avenue George V.
Inspired by a Fabergé egg, this restaurant is full of small rooms that are covered in Art Nouveau mosaics of peacocks and flowers. 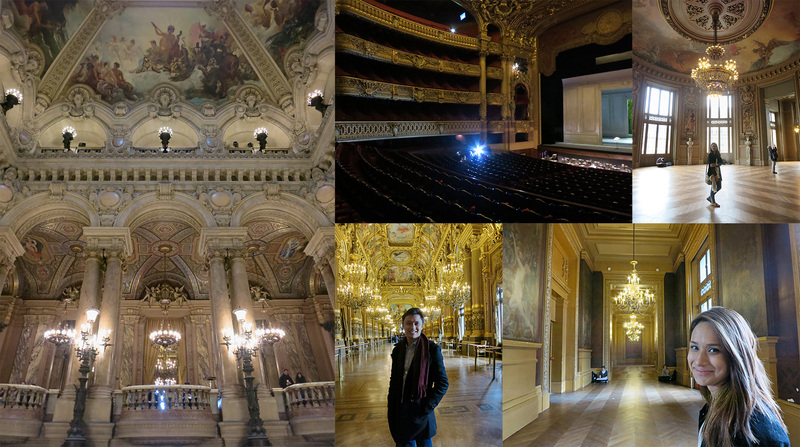 Just walking through the dining room is quite an experience. Their traditional french cuisine is memorable and left us raving about it all day. They may also have served me the best crème brûlée I’ve ever had. Although we came across this gem by accident, we will never regret walking through its doors! 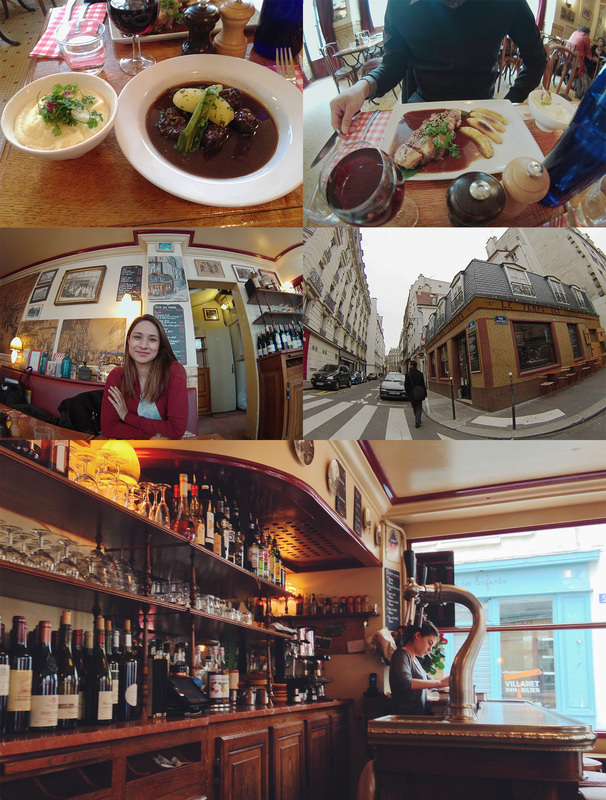 This small restaurant and cafe was tucked into one of the tiny streets we found ourselves on as we wandered from Le Marais. We knew we were far the touristy side of town because the menu was entirely in French and we had to rely on the waitress’ attempt to translate. After a little bit of a guessing game, Jon ordered some version Duck Confit topped with an exquisite banana sauce and I tried some sort of beef stew flavored with raspberries and served with a side of creamy potatoes. 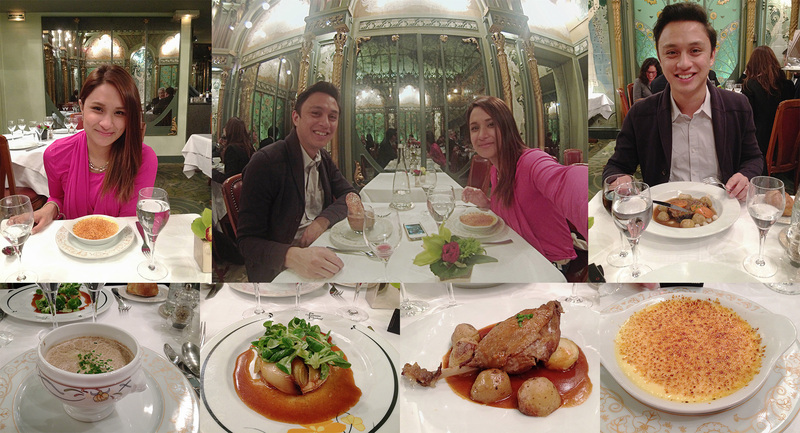 It may have been the most unconventional yet extremely homey french dishes we’ve ever had. 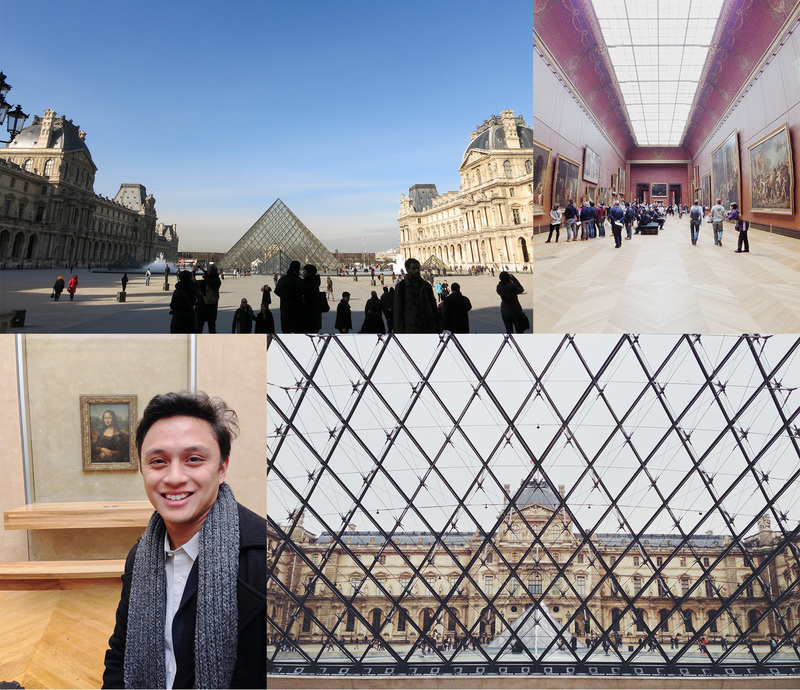 Overall, we couldn’t ask for more from our Parisienne adventure. 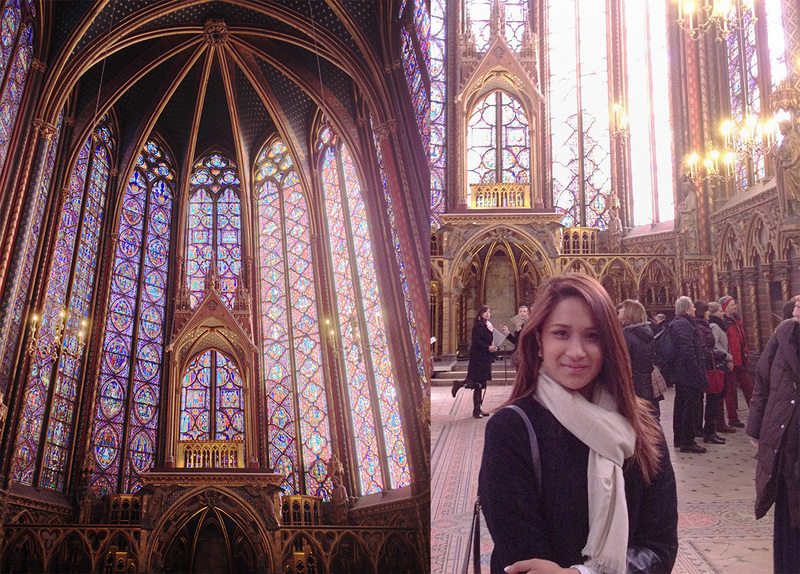 Paris has a unique magic, and we will be one of those couples forever captivated by this city of love.